12”-14”: 2 bundles; 16”-22”: 3 bundles; 24”-28”: 4 bundles. If you want a full effect, 3-4 bundles will be recommended. 3 hair bundles with a closure is also a good choice. Virgin hair is ALWAYS Remy hair, but Remy hair is not always Virgin Hair! ★Completely natural hair like yours or mine. Why are my extensions getting tangled? Due to dryness, oil and dirt built-up, your hair extensions may get tangled. Besides, exposure to salty water or Chloride cause tangle as well. Please use wide-toothed comb to brush your hair daily to prevent tangle. Why is there gray hair? It’s normal that virgin hair has few strands of gray hair inside. We’ve picked them out before production to make sure there’s minimum gray hair. Does the hair keep pattern well after wash? Body wave do not act well while other textures all work very well after wash. As the body wave is not a kind of original very wavy hair, it may turn to a natural wavy or natural straight texture.However, it’s the hottest texture for its softness and extraordinary restyling performance. How long does the hair extensions last? 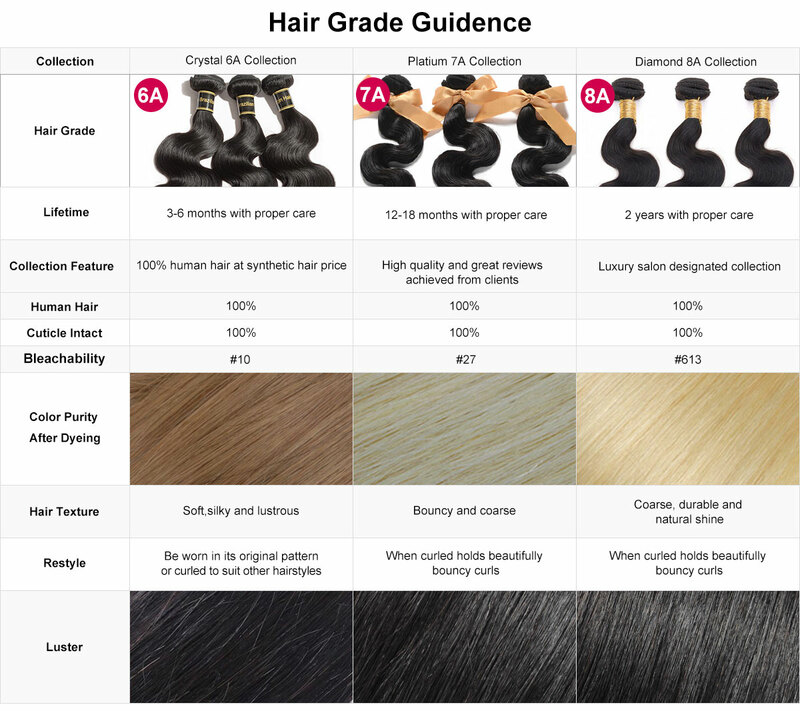 It depends on how well you take care of the hair extensions. It can last over 1 year with proper care. Please be aware that if it's dyed, overheated or chemically processed in other ways, its service life will be shortened. Usually we will put low declared value in the invoice to avoid Custom tax, but due to different policy in different countries (especially in South America and Africa), there might be some Custom Tax which is not considered in the price and should be paid by the buyers. You could leave a msg when placing order about how much you want us to put on the invoice. All returns will be considered on a case by case basis. All hair must be in the original packaging with all labels attached. Unravelled or used bundles could not be returned or exchange. How long I can expect the wig to last? How to find my size?